Implants are artificial dental roots that are placed into the jaw bone and take over the role of the dental roots of the replaced teeth. They consist of a cylindrical part or a screw made of titanium, ceramic or a combination of both elements. These are biocompatible materials successfuly used for many years in dental surgery. The implant fixture is connected to an abutment, which itself is a connective element for dental prostheses. Together they establish a firm connection for dental crowns, bridges and other prostheses. Therefore, we can avoid smoothing healthy adjacent teeth. 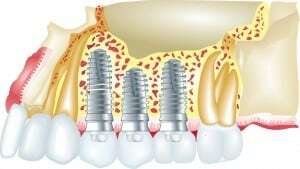 Severe caries, periodontal (gum) diseases or loss of teeth due to accidents are the main reasons for dental implants. Unlike conventional dentures, bridges, partial or full prostheses, implants prevent bone loss because they stabilize the jaw bone. In addition to that, a high chewing comfort as well as the preservation of healthy teeth combined with an exceptional look are advantages of artificial dental roots. Hence, further damage by dental restoration is reduced to a minimum. Dental implants are very popular owing to their high durability as long as oral hygiene is impeccable and professional dental cleanings are carried out regularly. Dental implants are not only the safest alternative when it comes to artificial teeth but are also a solid foundation of further dental care. blood formation and metabolic disorders (e.g., diabetes): dental implant surgery is possible if wound healing abilities are high and infection risks are low enough.